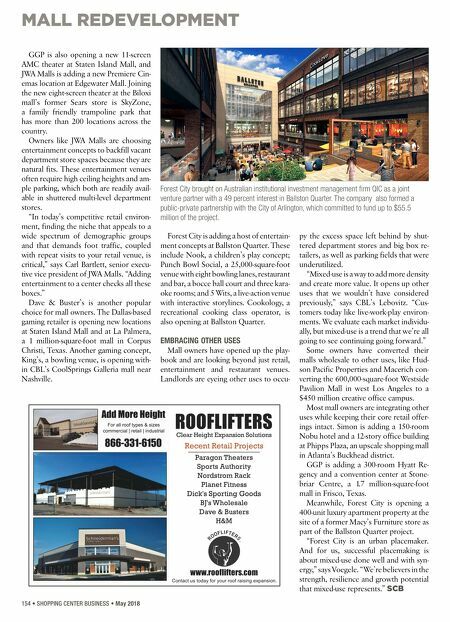 MALL REDEVELOPMENT 154 • SHOPPING CENTER BUSINESS • May 2018 GGP is also opening a new 11-screen AMC theater at Staten Island Mall, and JWA Malls is adding a new Premiere Cin- emas location at Edgewater Mall. Joining the new eight-screen theater at the Biloxi mall's former Sears store is SkyZone, a family friendly trampoline park that has more than 200 locations across the country. Owners like JWA Malls are choosing entertainment concepts to backfill vacant department store spaces because they are natural fits. These entertainment venues often require high ceiling heights and am- ple parking, which both are readily avail- able in shuttered multi-level department stores. "In today's competitive retail environ- ment, finding the niche that appeals to a wide spectrum of demographic groups and that demands foot traffic, coupled with repeat visits to your retail venue, is critical," says Carl Bartlett, senior execu- tive vice president of JWA Malls. "Adding entertainment to a center checks all these boxes." Dave & Buster's is another popular choice for mall owners. The Dallas-based gaming retailer is opening new locations at Staten Island Mall and at La Palmera, a 1 million-square-foot mall in Corpus Christi, Texas. Another gaming concept, King's, a bowling venue, is opening with- in CBL's CoolSprings Galleria mall near Nashville. Forest City is adding a host of entertain- ment concepts at Ballston Quarter. These include Nook, a children's play concept; Punch Bowl Social, a 25,000-square-foot venue with eight bowling lanes, restaurant and bar, a bocce ball court and three kara- oke rooms; and 5 Wits, a live-action venue with interactive storylines. Cookology, a recreational cooking class operator, is also opening at Ballston Quarter. EMBRACING OTHER USES Mall owners have opened up the play- book and are looking beyond just retail, entertainment and restaurant venues. Landlords are eyeing other uses to occu- py the excess space left behind by shut- tered department stores and big box re- tailers, as well as parking fields that were underutilized. "Mixed-use is a way to add more density and create more value. It opens up other uses that we wouldn't have considered previously," says CBL's Lebovitz. "Cus- tomers today like live-work-play environ- ments. We evaluate each market individu- ally, but mixed-use is a trend that we're all going to see continuing going forward." Some owners have converted their malls wholesale to other uses, like Hud- son Pacific Properties and Macerich con- verting the 600,000-square-foot Westside Pavilion Mall in west Los Angeles to a $450 million creative office campus. 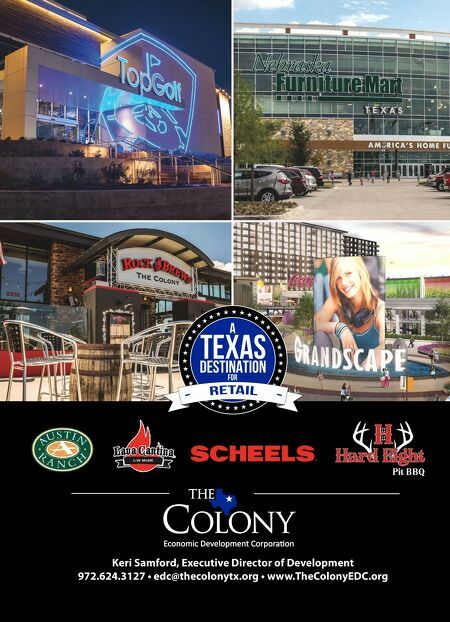 Most mall owners are integrating other uses while keeping their core retail offer- ings intact. Simon is adding a 150-room Nobu hotel and a 12-story office building at Phipps Plaza, an upscale shopping mall in Atlanta's Buckhead district. GGP is adding a 300-room Hyatt Re- gency and a convention center at Stone- briar Centre, a 1.7 million-square-foot mall in Frisco, Texas. Meanwhile, Forest City is opening a 400-unit luxury apartment property at the site of a former Macy's Furniture store as part of the Ballston Quarter project. "Forest City is an urban placemaker. And for us, successful placemaking is about mixed-use done well and with syn- ergy," says Voegele. "We're believers in the strength, resilience and growth potential that mixed-use represents." SCB Forest City brought on Australian institutional investment management firm QIC as a joint venture partner with a 49 percent interest in Ballston Quarter. The company also formed a public-private partnership with the City of Arlington, which committed to fund up to $55.5 million of the project.